Cleaning a rubber mat in a bathroom is one of the easier tasks you will face when cleaning your bathroom. 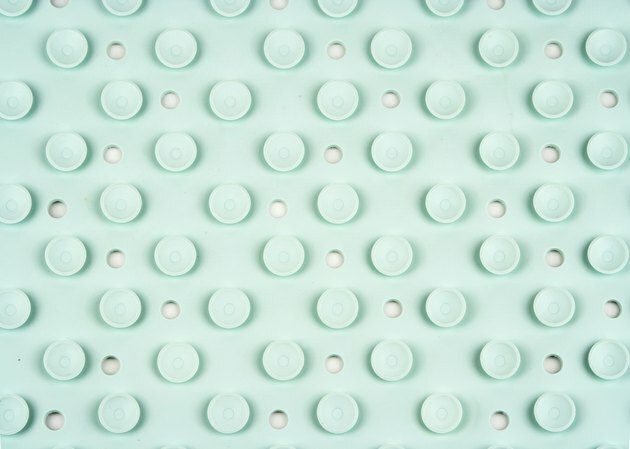 Rubber mats are easy to clean because they can be moved easily to better locations for cleaning, are resilient to different treatments and are cheap to replace if something goes wrong. Most rubber mats can handle a number of different cleaners, which makes the task a snap when you try to remove dirt, dust, mold, mildew or other matter on the mat. Remove your bath mat from the bathroom, or place it in the bathtub for cleaning. Fill a bucket with water and add one cup of soap or detergent. Soak the rubber mat in the cleaning solution and let it sit for a few minutes. This soaking will help soften and loosen up any filth that is dried to the rubber. Scrub the surface of the rubber mat with a cleaning sponge or brush. If you find hard-to-remove substances, you can use a harder, more abrasive scrubbing brush. Most rubber mats can handle hard cleaning brushes or pads, but you'll want to make sure that the scrubbing tool you use won't cut or tear the rubber mat. Rinse off the mat with clean water, or spray down with a hose if you want to blast off any remaining dirt or other items on the rubber mat. Hang the rubber mat outside to dry, or use a rag or towel to hand dry the mat. If the mat is going back into the bathtub, you can place it there to let it dry. If you have a specific substance that is stuck on the bath mat that needs special cleaning, such as mildew, use a product that specializes in cleaning off that substance. If you use bleach, be aware that large amounts of bleach exposed to the bath mat for long periods of time may cause lightening or bleaching of the mat's color, if it is other than white.